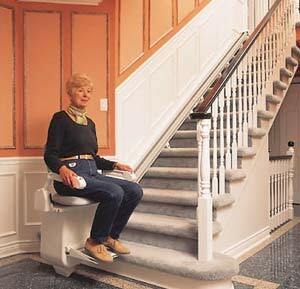 Using a stair lift is a fairly simple procedure. The user will stand in front of the stair lift chair and sits on it as they would a normal chair. Most stair lift seats swivel at the top landing and some will also swivel at the lower landing. If possible, it's always safer and easier to access the chair (or dismount from it) when the seat is swivelled away from the staircase. Accessing the stair lift seat will be more difficult than a normal seat as it will be significantly higher because the motor, batteries, transmission and electronics are all housed in the base of the seat. Once seated the user will swivel the chair seat so it faces across the stairway and locks in place. The user then flips down the foot rest, if it isn't already down, to rest their feet on. The foot rest will support the users feet and legs while protecting them for injury should the lift hit anything on the stairway while the stair lift is moving. Cut-off switches are mounted in the foot rest to stop the lift should it come in contact with anything on the stairway. If these safety switches are activated the lift will no longer run in the direction of the obstruction but will run in the opposite direction. Stair lifts come equipped with a seat belt. It may be retractable or it may be hanging loose but it is recommended that it is used by the stair lift user to secure them on the seat in case the lift stops abruptly or the user loses their balance. The stair lift may have flip up arms to aid in accessing the lift. If so, the arms must be flipped down to provide arm and trunk support during use. Additionally, the user control switch for the stair lift will normally be mounted at the end of one of the arms and out of reach if the arms are left flipped up. Some models that offer flip up arms put a cut off switch in the arms so the stair lift won't work without the arms in the proper position. When the arm switch is activated the motor will rotate the gear that is meshed into the track and the chair will move along the stairway. The activation switch is momentary and is usually a rocker switch. When one side of the switch is pushed to stair lift moves in one direction and when the other side of the switch is pressed the stair lift will move the opposite direction. Once the user reaches the opposite end of the stairway they unlock the seat, swivel it away from the stairway (if possible) and dismount from the seat.